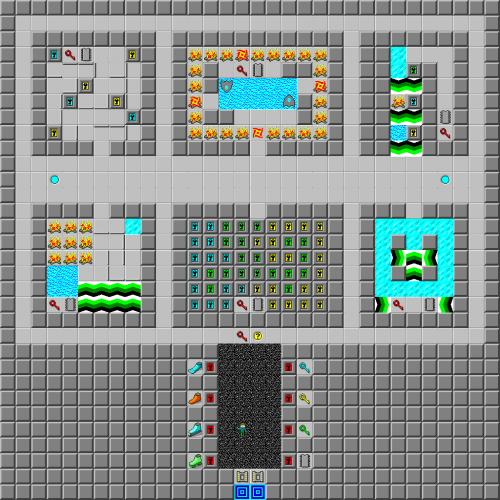 Tool Shed - The Chip's Challenge Wiki - The Chip's Challenge Database that anyone can edit! Choose your tools wisely. One must be left behind. Tool Shed is the 33rd level in Chip's Challenge Level Pack 4. It was created by Andrew Menzies. 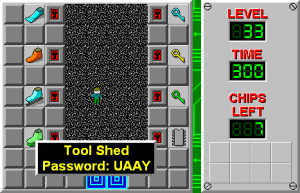 The main idea of the level is that each red key must be used to collect a specific tool; however, there are eight tools and only seven red keys. The ice skates are the tool the player must ignore to solve the level, as every other chip can be collected without ever having to use them. This page was last edited on 29 March 2019, at 09:13.